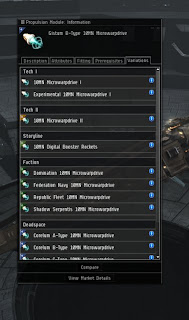 Back in Febuary or so I commented on the Eve Lexicon. I pulled from Eve Uni's wiki about Eve Online's Lexicon for the occasion. In February, when I had just joined my corp, I had no idea what 70% of the conversations were about. It sucked. My solution was to go off and learn what they might mean and educate myself. I have accomplished that. Now, technical discussions are often over my head due to lack of experience instead of lack of general game speak/technical speak/eve lexicon issues. I did not realize the process was happening until a month or so ago when I confused a 2 day old player when I casually explained something in 'eve speak'. I used such things as rats, pewpew, sec, sessions, aggro, and other such terms that make near zero sense without the game references behind them. I often try to fully define terms in my blog, although sometimes I succumb. This type of thing is also apparent in common game slang, such as 'shiny ships'. A shiny ship is one that is expensive and/or has expensive modules. There are several types of these. They all possess small colored symboles at the upper left corner of the module. In the item shown above, there are three sections. The top sections are 'normal' items. They come in 5 meta levels of quality. The first is what is called meta 0. That is something a player can make. Then there is meta 1-4. Those types only drop from NPC ship wrecks. They are normally (but sometimes, oddly not always) better the higher they go. People will speak of Meta 4 or 'named' items to use. The middle group with the orange II is a T2 module (tech 2) which are also meta 5 modules. These are almost always (but of course, sometimes not) better then the T1 (tech 1) variant. Then there is the shiny modules. They go by the English Alphabet. They also have meta levels but they just keep going up and up. A is better then B and B better then C. Then there is Gistii and Pithi... that is about what it is and how it fits (the needs of the module on the ship to be used). 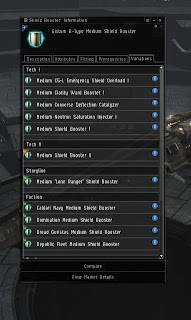 Faction modules are considered the best and they also need lesser skills to fit then a T2 module. They also only drop from very specific NPCs who tend to have random spawn rates. Also spawning the NPC does not mean the modules will automatically drop. 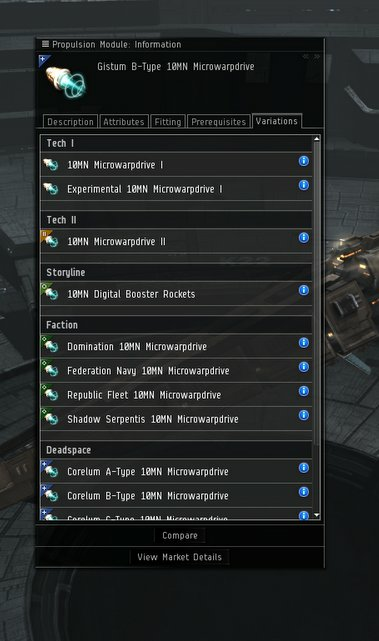 Rariety equal expensive and expensive = shiny in Eve. 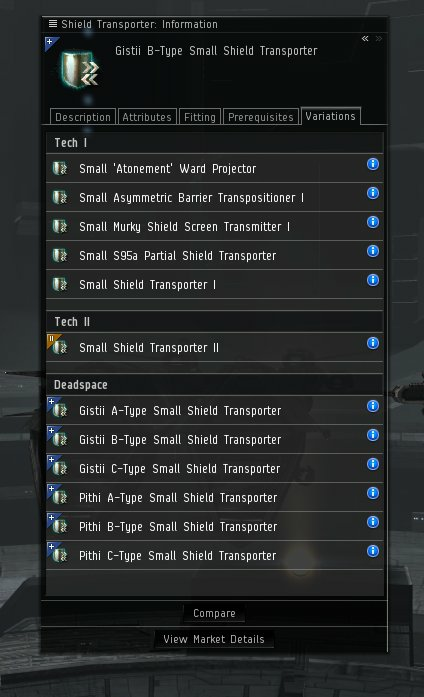 Shiny modules/ships do not = an IWIN Button. We have shiny ships and shiny modules. Due to the bastardization of the english language, this is also refered to as bling. One can pimp out a shiny ship with bling. 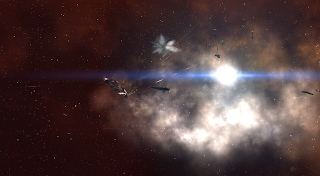 I noticed that this had become a normal part of my day when someone showed me a tengu kill and I asked them to warn me to put on sunglasses before I opened such a bright, intense ship fit after I looked at it. 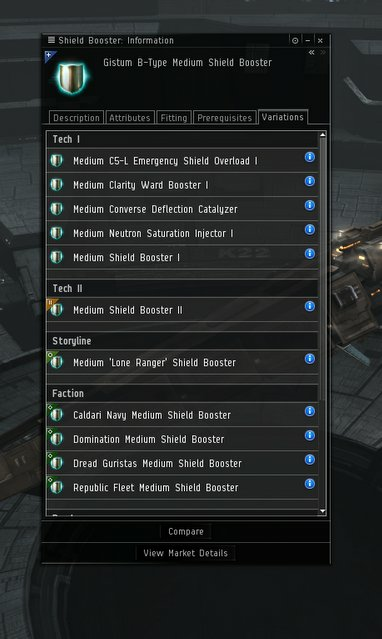 Shiny Modules are how I make a lot of my isk. I find plexs and hope that they drop shiny things that I run off and sell. Even as I write this blog I am working on a 5/10 plex that I found with an alliance mate who is tanking the damage. We will then split the isk if we are so fortunate as to get a drop. I will insert that not all 'shiny' modules are expensive. Some are very inexpensive (in the low millions) and less expensive then their meta 4 brethren due to how easy they are to get. Most of these are small modules that drop in static complex and high security space plexs. Numbers will dilute cost time and time again. I found this plex as part of scanning. I was instantly excited. Then I saw that no one was on and my excitement decreased dramatically. I do not yet have a ship that has the tank for a 5/10. I sat on it and waited for a bit. I had to go to bed shortly and as I was giving up on someone logging in and docking to write someone a contract with the bookmark, one of my alliance mates logged in and I pounced. And the end score is a Gistum B-Type 10MN Microwarpdrive (180mil)and a Gistum B-Type Medium Shield Booster (We averaged it between buy and sell orders to 600mil). Both items are shiny. With the Overseeers Effects (sold to NPC buy orders) my split came to 420 mil, making the entire plex haul roughly 840mil for about 20 minutes worth of work between the two of us. In other games, the shine is on the outside. Your armor gets cooler and fancier and more spectacular as it becomes more badass. In Eve, our ships tend to look the same (minus strategic cruisers, I'm not getting into that now) but the inside is what counts. Sometimes there are so many expensive modules that you swear the ship is glowing... It also leads to people saying things such as, "I blew up the ship to see if anything tasty was on the inside." Each item placed on the ship has a 50% drop rate. Potentially, everything can drop (buwhahha if that happens) and nothing can drop (much more likly due to poor sacrifices to drop gods). Normally, something drops. The question is if its the something you wanted or not.